So, a lot of you know, that I had been in India during the better part of October to be with family during the most festive time of the year. I spent Durga Puja in Kolkata, where I went for the first time after my wedding. It was like coming home of sorts. And then I spent some good fifteen days in Mumbai as well. My time in Mumbai was so full of gorgeous sarees and delectable gota-patti suits, that I had the most fun I have had in a long time (You all know how much I love dressing up!). Now then, you might ask, what is the point of this blog? What am I getting at? As soon as I reached Mumbai, I was engulfed in the celebrations that surrounded Karwachauth. It was my first after my wedding, although I have been observing this fast for a really long time – From the time, I had met the guy I knew I would marry. So yes, ten years to be precise. Every year I read articles by feminists, who vehemently condemn this practice as misogynistic, every year I come across random people on social media grunting and grumbling on why women put up with this façade of a festival which is only considered successful if the married woman keeps herself hungry the whole day. And every year, at least one person asks me the same question, why on earth am I observing this fast? And this year was no different, and this time, when so many people who read my blog and understand me as a free-spirited, independent woman with principles as strong as steel, it was difficult for them to digest that I, too am succumbing to the pressures of society. And so, today, I would want to tell you all the whys and hows of this puzzle that has been baffling my readers. So yes, I started observing the Karwachauth fast ever since I met my partner. I think my first time was in college (eleventh grade), and we had our semester exams going on. I remember waking up early in the morning, well before sunrise, stuffing my face with every variety of eatable on the table, which my grandma very dearly prepared for me (waking up even earlier than me). I met him on our way to college – I had forgotten all about food and hunger since my attention was immersed into my thick textbook. It was the last exam of the semester. We hurried into our classrooms and soon got busy for the next three hours solving calculus problems and crunching numbers that involved cube roots and other ferociously scary things. It was only after my exam that I noticed that my boyfriend was not eating anything either. This covert was easier than solving the cube root of 3645 – He had been fasting as well. No, he did not believe in it, he did not think that staying hungry for someone for a day could add incremental years to one’s life, and yes, he’s a big-time foodie. So, I asked him, why? – He said that it didn’t matter if he didn’t believe in it and it didn’t matter that this straightaway writes off his strong scientific dogmas – What mattered is that, it mattered to me. And he has been keeping this fast, just like I have, for the last ten years too. Because it matters to me. And he wanted to support me. He once told me, I cannot stop you from following your belief, but the least I can do is to stay hungry with you when you’re frantically checking the watch and the sky in quick succession for the moon to show up. We broke the fast together that day, in the dark hall of a movie theatre, hand in hand, our eyes glassy, munching on caramel popcorn and samosas with an enthusiasm of a famined hippo. Now, coming to the point on why a modern and rationally-thinking girl follows a tradition which is made out to be chauvinistic, patriarchal and misogynistic. Well, it is not, for me, because, in my case, my husband observes it too, making it equal and gender-unbiased for starters. Although, even if he wouldn’t observe the fast, it wouldn’t bother me. The thing that the world forgets is, it is only chauvinistic, if the woman in question is forced to do something that they don’t want to. It is only patriarchal if the men in the family expect their women to fast, and the women fast out of fear, rather than devotion. It is only misogynistic if the women in question is not allowed to exercise her choice. And that is my reason. Choice. It is my choice that I fast for my husband once a year. It is no big deal. I don’t know if me fasting for my husband is going to make him live a long life. I do it, because I want to. Because it is really romantic. Because it is a lot of fun to go through with the entire proceedings of applying mehndi the night before, the sargi in the morning, and sleeping together right afterwards, and waiting for the moon together. Because I get a lot of gifts and love from my husband on that day (and likewise!). Because I love to dress up in beautiful fabrics, wrapped from head to toe in shimmering jewelry. And also because I am really, really filmy. The grand, larger than life, 70mm romance of SRK-Kajol is to be blamed for my fixation with Karwachauth. Jokes apart, my point is, I do it, because it is my choice, and I don’t owe anyone an explanation for my choices in life. I do it, because I am in love and I find it very romantic. At the very same time, I would never look down upon or condemn someone who does not fast on this day. Because it is, after all their choice. I would happily listen to them, and even understand them and respect their opinions. Feminism is something people massively misunderstand – It is upliftment of the eminence of women to be at par with that of men – But what is this upliftment, precisely? – This upliftment is nothing but defending the choices that women make – Upliftment isn’t telling women not to observe Karwachauth, upliftment isn’t telling women not to wear a hijab – To some, it might seem like such women are downtrodden, and need uplifting, and some of them may really need the uplifting, if at all they are participating in such acts against their wishes. But, for some, it is a choice. As simple as that. To tell you the truth, this feud started when I began posting pictures on my Instagram where I literally had Ek Chutki Sindoor on recurrent pictures of mine. A reader asked me about it, and one thing led to another, and here we are. 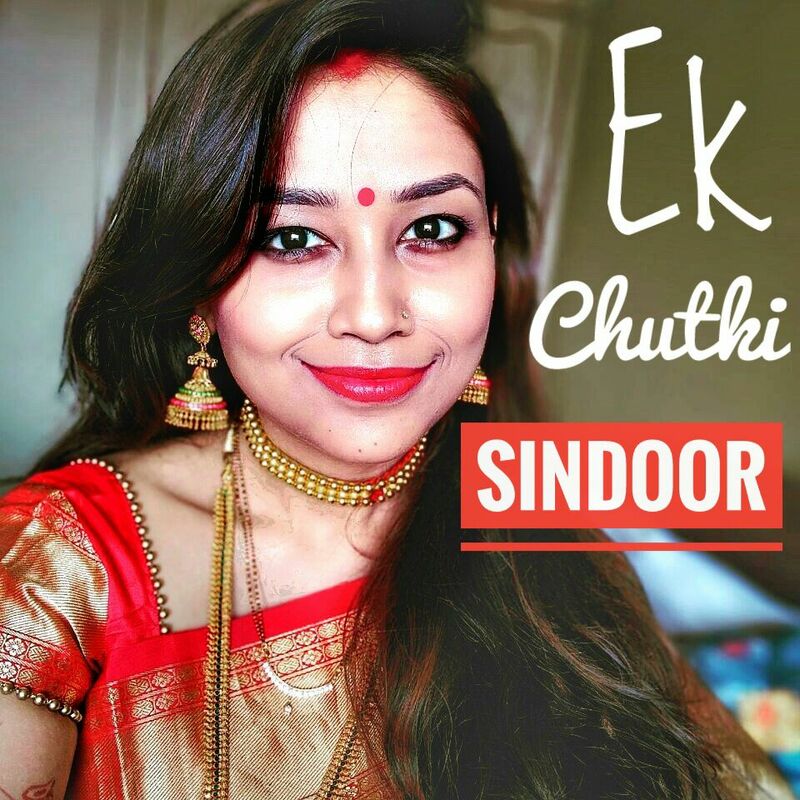 So yes, I do have my Ek Chutki Sindoor on, every day, and yes, I don’t do it because I am a married girl and this is exactly what is expected of me. I don’t do it to please my husband or in-laws and I don’t think doing this is going to make my marriage last longer or automatically give my husband a long life. And although I believe in gender equality, I do not expect my husband to wear it too – Because, c’mon, it would look ridiculously funny. I do it, because it is my choice. And mainly because, it looks pretty damn hot!